In an attempt to fix the symptom-based model of acupuncture, Professor J.R. Worsley (1923 – 2003) brought Classical Five Element Acupuncture to the West. After he served in World War II, Worsley practiced physiotherapy and studied osteopathy, naturopathy and acupuncture. In the early 1950s he traveled to Taiwan, Singapore and Korea to further his studies and was awarded a Doctorate in Acupuncture. It was during his time there that he first came across the Five Element system of acupuncture and was drawn to the way it looked at every aspect of a person’s physical, mental and spiritual well-being in order to diagnose the root cause of his or her imbalance. After studying under his Five Element teachers Ono and Hsui, in 1955 Worsley was awarded the title of “Master” of Five-Element Acupuncture. Although sharing much with modern TCM it is also very different in theory and aim. Rather than focusing on treating symptoms, in Classical Five Element Acupuncture there is thought to be one main or root cause for most of a patient’s presenting symptoms. It is thought that through birth or early childhood that a constitutional weakness develops to the point where, through the law of Mother-Child, it impedes the flow of energy around the Sheng or creative cycle. This weakness is one of the Five Elements, an element that is causing the presenting symptoms and stopping the growth of the person as a whole. This weakened element is known as the person’s Causative Factor (CF) and true healing can only happen when the treatment is directed towards healing the person’s CF. 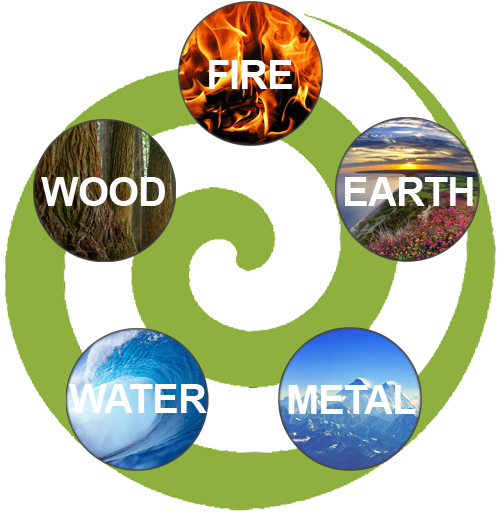 The Five Elements, Wood, Fire, Earth, Metal, and Water, represent the five phases of Qi as it moves through nature and our bodies. The Elements work interdependently in an elegant and systemic balance, each one sustaining and supporting the next in the cycle. This cycle can best be seen in the change of seasons: Wood corresponds to the birth and growth of plants and trees in the spring. What is planted in the spring comes to maturity under the heat and vitality of Fire in summer. The warmth of Fire creates the abundance of the harvest of the Earth in late summer. After the harvest comes the decay of autumn, where the leaves falling from the trees nourish the soil and produce the mineral resources of Metal. The mountains and mineral rocks create and bind the flowing streams of Water, moving quietly under the surface of the ice in winter, which, in turn sources the germinating seed of Wood. The Five Element practitioner is trained to see, hear, smell and feel signs of elemental imbalance and to perceive the level at which the imbalance is rooted. Each person is unique. Even though people’s symptoms may appear similar, each person’s causative factor is unique to them and the treatment is based on the individual need of each person. By treating the root cause of dis-ease in the patient, the Classical Five Element system of acupuncture elegantly restores balance and harmony and returns us to the health and well-being that is our natural birth-right. Copyright © 2013 Classical Acupuncture Healing. All rights reserved.